Keen to head off Lockheed’s anticipated marketing push on behalf of the F-35, Airbus announced today that it had submitted a formal offer to the German MoD to replace the Tornado strike fighter with the Eurofighter. MUNICH --- On the eve of the ILA Berlin Air Show 2018, Airbus and Eurofighter GmbH have submitted their offer to the German Ministry of Defence for a replacement of the Bundeswehr's ageing Tornado combat aircraft, which was developed in the 1960s, and have established the Eurofighter as its ideal successor. "The Eurofighter is already the backbone of the German Air Force and is therefore the logical option to adopt the capabilities of the Tornado in the medium term," said Bernhard Brenner, Head of Marketing & Sales at Airbus Defence and Space. "We have an excellent aircraft, its production secures important aircraft construction know-how in Germany and, at the same time, strongly supports European sovereignty in defence. The successful continuation of Eurofighter production could also lead to further cooperation with other European nations such as Switzerland, Belgium and Finland." 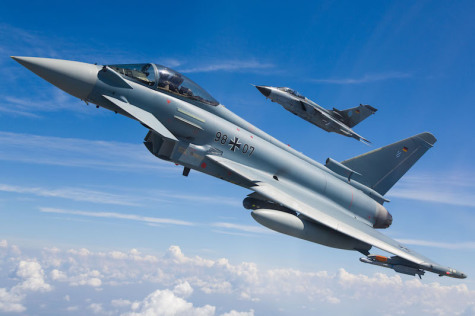 Volker Paltzo, Eurofighter Jagdflugzeug GmbH CEO, said: "I am confident that Eurofighter Typhoon can provide a cost effective and attractive solution for Germany, which will deliver every capability and perform every mission the German Air Force needs." The Bundeswehr currently operates 130 Eurofighters and 90 Tornados. The German Air Force's fleet of combat aircraft is used both for missions to secure airspace sovereignty over Germany and in international NATO alliance missions around the world.